it’s hot, but that’s not going to stop me from making desserts! it’s only going to make me more creative about how to make ’em. my quest this week has been to help us get our sweets fix without turning on the oven. get excited about lots of icebox / no-bake recipes over the next few weeks! after chilling overnight, the cake easily released from the springform pan, i garnished it with chocolate shavings (which looked beautiful) + it was ready to sample (yes, at 9 AM)! holy deliciousness. the chocolate-ricotta layers are mousse-like, with a light yet rich creaminess. the cookie layers provide a wonderful flavor, a nice change in texture, + they softened just enough (i worried that they’d be too crunchy). this far exceeded my expectations – it’s a gorgeous, delicious + no-oven-needed cake that is surprisingly easy to make. this is a must try, friends! prepare pan: remove sides from a 9-inch round springform pan. place a sheet of waxed paper over bottom, leaving an overhang; lock sides onto bottom, securing paper. spray inside of pan with cooking spray; line sides with a strip of waxed paper 28 inches long + 4 inches wide. make chocolate-ricotta mixture: break 12 ounces of chocolate into pieces. place in a heatproof medium bowl set over a pan of simmering water. cook, stirring occasionally, until chocolate has melted, 8 – 10 minutes. in a food processor, blend ricotta until very smooth, about 1 minute, scraping down sides of bowl. add warm chocolate; blend until smooth. in a large bowl, beat cream until stiff peaks form. with a rubber spatula, gently fold in chocolate-ricotta mixture. assemble cake: arrange half the crushed cookies to cover bottom of pan. spoon half the chocolate-ricotta mixture on top of cookies; smooth top. cover with remaining cookies; top with remaining chocolate-ricotta mixture, + smooth the top. cover with plastic wrap; refrigerate at least 6 hours + up to 2 days. before serving, release sides of pan + remove waxed paper from sides. using bottom piece of waxed paper, pull cake onto a platter; with a metal spatula, lift cake + remove waxed paper. using a vegetable peeler, shave remaining 2 ounces chocolate over top of cake. with a knife dipped in hot water, cut cake into 10 slices (wipe off knife, + dip in hot water after each slice). i think this may be my favorite thing you’ve ever posted. ever. ok, tied with the nutella cookies. i have been looking for a creative use for my mini springform pans, and i think this is it. woohoo, glad to hear it! this recipe would convert easily for mini springform pans – i didn’t measure out any of the layers – just eyeballed ’em – + they turned out surprisingly balanced. let me know how it turns out! For chocolate wafers, I just scrape out the middle of oreo’s, and use the cookie part. Just in case you run into not being able to find chocolate wafers. Fairly certain this cake is in my near future, looks SO yum! ooh, thank you for the tip! i wish you could have seen me walking up + down, up + down the cookie aisle trying to find the damn things. the newman’s cookies were a great substitute, + thankfully they were on sale. i would never have thought to sub in oreos sans the creme – smart! Good gravy, i’d eat that whole thing in one sitting. I cannot believe how few ingredients are in it??!! Sold! This will be perfect to make with my inlaws at the beach in a couple of weeks – my nephews will love it. Smart idea using Newman’s. I’ve seen the fancy chocolate wafers at places like The Fresh market or gourmet shops, but they can be super expensive. Love Julia’s oreo idea too – brilliant! 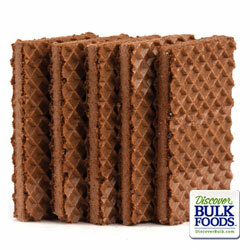 i have yet to find chocolate wafers anywhere, but i should try gourmet shops, or maybe trader joe’s? until then, good to see that there are some easy substitutes. ha, nothing’s wrong with cake in the morning! in fact, i think it largely contributed to my awesome day so far. =) can’t wait to hear how it turns out for you! YUMMMMM! I need to try this, I need to try an ice box cake period! I guess the heat is getting to my baking desires too.. YUM! amber, icebox cakes + pies are super easy – easier than a baked version, i’d even say. it definitely makes getting your dessert fix a lot easier in this crazy hot weather! Chocolate at 9am? a-b-s-o-l-u-t-e-l-y!!! The cake looks so good I wanted to stick a fork into the screen. Where is the darn taste-o-vision when you need it? if you’re talking about a box like this one, then you’re absolutely right – that’s the brand everyone recommends but neither of the two krogers in our ‘hood carry ’em. 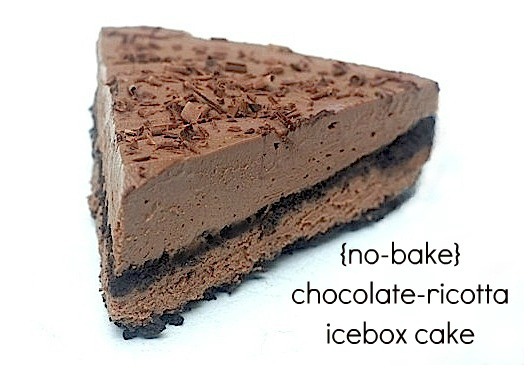 =( lots of icebox cakes call for them, so i’d really like to figure out where they’re carried in nashville. i’ve had good luck finding those chocolate wafers at publix- sometimes they even have them out on the aisle displays! I can’t believe so few ingredients make this gorgeous cake! I love the idea of having something so decadent and not having to turn on the oven. Very creative! Guess it is time to finally buy a spring form pan! I don’t know why I don’t have one yet, but I’m definitely going to get one now!! My husband would love this!!! He is definitely the chocolate lover in our house…although I am sure that I will enjoy my share of the dessert as well!! i bought my first springform pan less than a year ago + i use it all the time! i was afraid it was going to be hard to use, but it’s super simple. you definitely should get one + give this a try for your husband (+ yourself)! I could use a piece of that right about now! But I’m, um, still recovering from a little overindulgence in cookie dough. Amazing Amy! So creamy! The crust was perfect! I think it was the chocolate alphabet cookies won over my 5 year old! She’s now a big fan! Thank you! isn’t it so amazingly creamy? i still can’t believe that there are only 5 ingredients in the whole thing. so glad you + the family enjoyed. =) thanks for being a taste-tester for me! Now I wonder what it’d be like with the wafers *I* grew up with (I was quite the connoisseur, too… I knew the good ones from the cheap-o waxy kind whose filling was a bit like oreo cream, only not tasty at all! )… I haven’t eaten them in YEARS, but vending machines sell this “Ruger” brand of them all over the place. how cool that it wound up getting posted to Bellwether Farm’s facebook page – i just checked it out. awesome! their ricotta *would* be amazing in this icebox cake. unfortunately, we don’ live near an Earth Fare, so Newman’s are the best substitute for the Nabisco’s Famous ones (which i have since found, but have yet to buy since i prefer the healthier qualities of the Newman’s.) thanks for sending me some other possible substitutions! I too had a very difficult time finding the Nabisco Famous Chocolate Wafers, but finally located them at Kroger in the ice cream section of all places, next to the toppings…very odd. I can’t wait to try this recipe. Thank you for the inspiration! yes! i eventually found ’em too in the ice cream section. had no idea they’d be there. they were pretty expensive, though (i think $4-$5 per package) so i wound up using my substitution again anyway to save a few bucks. =) can’t wait to hear how it turns out for you! I love icebox cakes, but I’ve never made one with ricotta before. Such a good idea. Hubby’s birthday is next week so I may have to try it! Next post: Our Wonderful Surprise Wedding – in pictures!